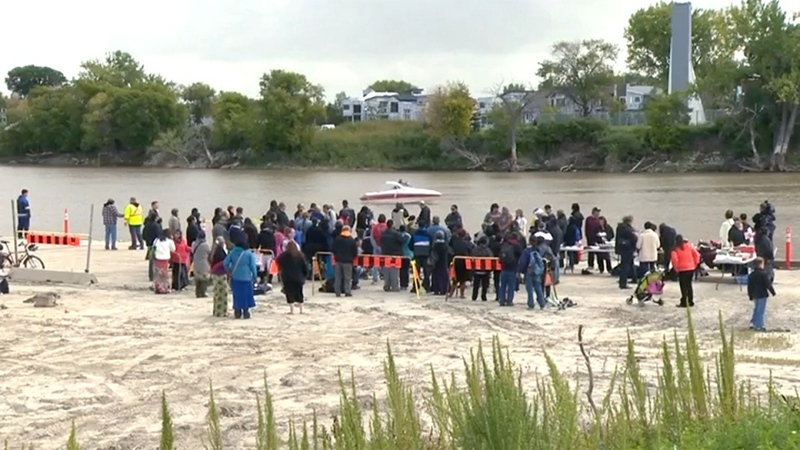 Bones have been found after community volunteers dragged hooks along Winnipeg’s Red River in the search for missing and murdered aboriginal women. Members of the volunteer group -- called Drag the Red -- handed over bones, a blood-stained pillowcase, a bloody carpet and dentures to Winnipeg police Tuesday afternoon in hopes of finding forensic clues. Police are analyzing the bones, as it’s still unknown if the bones are human. “Everything that we find, we put in a garbage bag and we just have to give it to police,” said volunteer searcher Calvin Alexander. Alexander -- who made several hooks for the search -- has been searching the riverbed along the shoreline, as other volunteers cast their hooks from boats. Drag the Red organizer Bernadette Smith said her sister Claudette Osborne has been missing since 2008. Smith said volunteers began signing up to drag the river last month. “The community has taken matters into their own hands,” Smith said. Many of the hundreds of volunteers gathered at Red River are family members of missing women. In the past 30 years, 1,200 aboriginal women have gone missing or been murdered across Canada. Volunteer Brittany Spence, 16, said she hopes clues will be found about her aunt who was seen walking along the river last week. Spence -- who is one of the youngest Drag the Red volunteers -- is keeping a bonfire going to comfort families and volunteers. “(It’s) like a little sharing circle just for all of the lost. The families who lost their loved ones,” Spence said. “We respect the fact that members of the public are taking it upon themselves,” Const. Jason Michalyshen said. “They want answers. They want resolution. They want it as much as we do. This is a community coming together,” Michalyshen said. Michalyshen said police officers will be present to ensure the safety of volunteers and help with any evidence volunteers find. Following last month’s discovery of the body of 15-year-old Tina Fontaine, volunteers began dragging the river on Tuesday. Fontaine was a runaway from foster care and her death has been deemed a murder. No arrest has been made. Fontaine’s death added urgency to calls for a national inquiry for the 1,200 missing and murdered aboriginal women since 1980. “It’s going to have to be us who do this. No one else will,” Assembly of Manitoba Chiefs Grand Chief Derek Nepinak, said in a statement. Volunteers say they will keep searching for as long as weather permits. People gather along the banks of the Red River during a search, in Winnipeg, Sunday, Sept. 14, 2014.